Weather you are an 1/8th scale racer, 4x4 SC or Monster Truck person, we have some motors for you. 550 size motors are longer than the normal 540 motor and produce more torque because of that. This also lets them run cooler. So if you have a 540 motor that is getting hot while you are pushing the limit, step up to a 550. If you have larger trucks or truggies....we offer the Toro 1/8th scale combos which include ESC, Motor and Programing card. 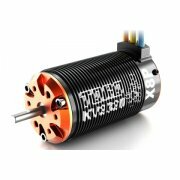 These motors usually have a 5mm shaft, so check the listing carefully to ensure you won't need additional items. 550 Sensored BL 3500KV ..
Feel the KA power with our newest 550 4-pole motors. These motors have kv ratings from 3500-4300kv s..
Maclan MR4 3500KV 4-Pole Competition Sensored Brushless Motor The MR4 Series 4-Pole SCT C..
Maclan MR4 4150KV 4-Pole Competition Sensored Brushless Motor The MR4 Series 4-Pole SCT Competiti..
Traxxas Velineon 3500 KV Brushless Motor. 4 Pole 550 Sensorless Motor. ..
XeRun SCT 3660 SD G2 Sensored Brushless Motor (3600kv) Innovati..